BarTender barcode software from Seagull Scientific is the world's leading design and print software for self-adhesive labels, thermal tickets, barcodes, cards and RFID tags. 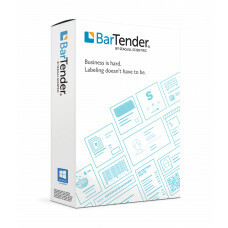 BarTender barcode software converts letters, numbers and even binary data into a pattern of lines, squares or dots that can be read at high speed by a barcode scanner and converted back into the original information. This software helps companies increase efficiency, reduce costs and meet regulatory requirements consistently and accurately. Unsure of what version of the software you require? Use the helpful version comparison on the products pages downloadable datasheet. Still unsure? No problem, simply call our friendly team on 0845 673 0047. Alternatively, take a look at our extensive range of barcode scanners, barcode label printers, labels and ribbons right here at the Barcodestore.co.uk.